Lactic acid is a chemical compound that plays a role in various biochemical processes. 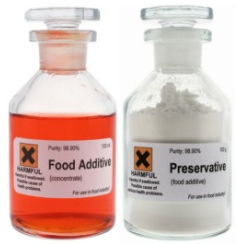 Lactic acid is widely used in the production of boiled sweets, pickled foods and as a raw material in the manufacture of important emulsifiers for the the baking industry. It is produced during anaerobic respiration and is commonly manufactured by a fermentation process, although it can be produced synthetically. Lactic acid is a carboxylic acid with the chemical formula C3H6O3. Lactic acid is found primarily in sour milk products, such as koumiss, laban, yogurt, kefir, some cottage cheeses, and kombucha. Lactic acid is also responsible for the sour flavor of sourdough breads.